All crustaceans have two pair of antennae at one point in their life, but other than that they vary greatly. Lobsters and crabs are crustaceans, so are crayfish, shrimp and pill bugs. Many species have 10 legs and thick, colorful carapaces over their backs that help protect from predation. Because so many types of crustaceans exist in so many different habitats, they are eaten by nearly every type of carnivore. Many lobsters and crabs prefer to live on sandy bottoms or in rocky ocean habitats. Not surprisingly, many of the predators of bottom-dwelling crustaceans are fish and other aquatic species. In the ocean, many bottom-dwelling crustaceans are preyed upon by bottom-feeding fish, octopi, and larger fish and marine mammals that can get to them. Larger animals that are unable to filter smaller phytoplankton prey on small planktonic crustaceans such as krill: Baleen whales feed entirely upon these small creatures. Alligators, crocodiles and other carnivorous reptiles also feed heavily on crustaceans. Birds are major predators of both aquatic- and land-dwelling crustaceans. Sea birds will gather various types of crustaceans from the water. Long-legged waders push their bills through the sand or mud to dredge up small crustaceans. Many bird species consume land-dwelling crustaceans such as crabs. Some birds drop hard-shelled crustaceans from heights to break them open. Birds particularly enjoy feeding on crustaceans that are soft-shelled or are moving between shells. It isn't uncommon for a land-dwelling mammal to wade through water to harvest crustaceans. Raccoons, opossums, apes, monkeys, rats, seals and sea lions among others enjoy a crustacean feast if it presents itself. Land-dwelling crustaceans such as various hermit crabs run the risk of consumption by any number of larger carnivorous predators. Humans are a formidable predator for several species of crustaceans, particularly crab, lobster and shrimp species. Crabs are a delicacy because of the muscle in their pincers and legs, lobsters because of their significantly muscular tail. 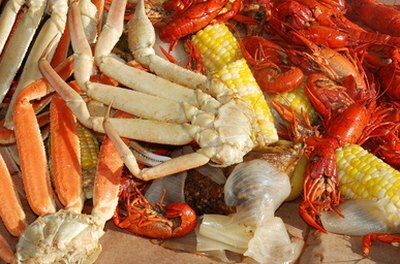 Crayfish, a freshwater crustacean, are a delicacy to many, particularly in the southern United States.